Soccer players rely on consistent equipment and conditions in order to perform at their best. 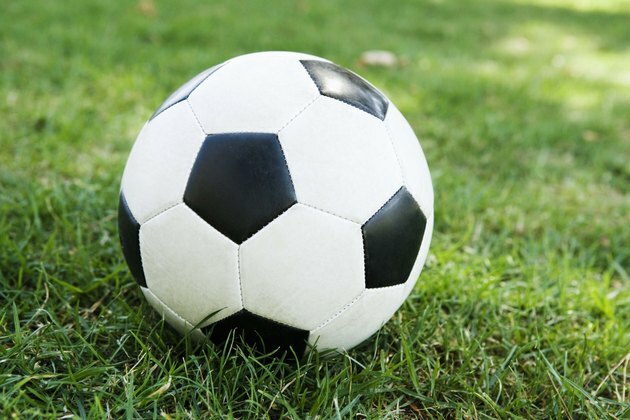 Because the soccer ball is the main piece of equipment in the game, there are several strict regulations and requirements regarding its size and weight. A soccer ball that is too heavy or too light impedes the game. All soccer balls are rated by their size. A soccer ball's size is measured by circumference in inches or centimeters and rated on a scale from 1 to 5. A size 5 soccer ball is the largest soccer ball produced and is used in all leagues above U12, or recreational soccer for those aged 12 and older. Size 5 balls are used by the Major League Soccer, by FIFA, semi-professional leagues, college and high school leagues. According to FIFA, a size 5 ball is between 27 and 28 inches in circumference. A ball's size has implications for its weight. In general, larger balls weigh more because they are made using more material. FIFA advises that a size 5 ball must weigh between 450 g, or 16 oz., and 420 g, or 14 oz. The ball's weight is measured at the beginning of the match. A ball may weigh more than 16 oz. during the match if it absorbs moisture from wet grass or if dirt collects between the panels and seams. Soccer balls have four main components used in their construction: the bladder, lining, cover and stitches. The bladder is the innermost layer, which you inflate with air. The lining protects the bladder and helps give the ball shape, and the cover protects the lining and the bladder from dirt and moisture. The stitches hold the panels of the cover together. Each component affects the overall weight of the ball. Multiple lining layers, heavier covers, extra stitching and thick bladders make heavy balls. Thin liners, covers and minimal stitching result in lighter balls. Nearly all size 5 soccer balls are built to FIFA regulations in both size and weight. However, you must use the ball properly to maintain these specifications. Inflate the ball with a standard mixture of air, not gases that include imbalanced mixtures of hydrogen or other low-density gases which might affect the weight of the ball. Use a standard hand-pump or foot-pump to ensure that your ball is inflated with the proper mixture of air and to the correct pressure.